SETH’S PICK :: ROCKETEER: CARGO OF DOOM HC: Didn’t I just write about Rocketeer last week? Indeed I did, and while there are several other books I’m excited about this week (Winter Soldier #16, Hellboy in Hell #4, Lost Vegas #1), it’s inevitable that I’ll re-read the new Rocketeer collection first thing Wednesday night. There’s an innocence to Mark Waid and Chris Samnee’s take on Dave Stevens’ classic character, but also a love for the traditions of pulp and adventure stories. Anyone could wax poetic about the genius of the Rocketeer, but it still boils down to entertainment value, and this collection has plenty of that. Oh, and there are dinosaurs. 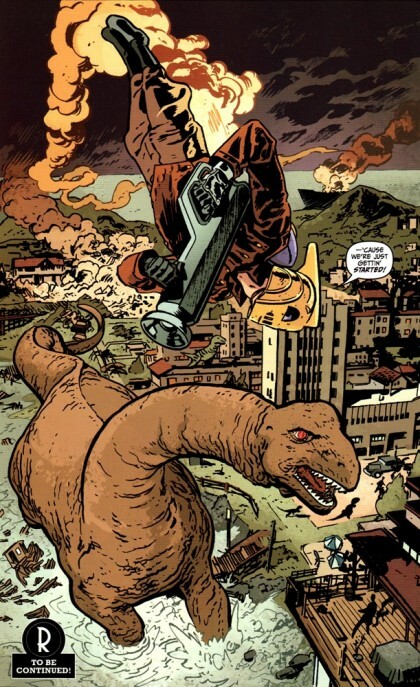 A guy with a rocket pack fighting dinosaurs in 1930’s California. That’s enough for me. ← HEROESCON 2013 :: GUEST LIST UPDATE :: MARK BROOKS, JOE STATON & MORE!